UPDATE Feb 28: Story in the Seattle Times. Seems very fair. The estimated the crowd at 250. 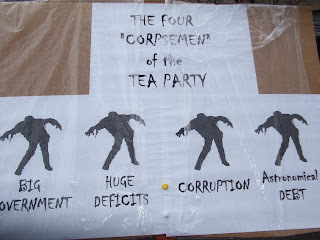 I attended my 5th Tea Party protest at noon today. 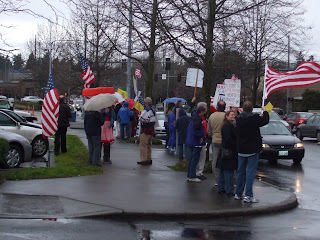 Today's event was fairly low key and quiet, we had no formal speakers, but we did have, by my estimate, around 125 American Patriots willing to sacrifice a Saturday Afternoon in the rain to tell our fellow country men "We gotta stop this insane spending!". The crowd was largely older and white, but I did spot a few younger folks, and non-white folks. There were a few critics driving by in cars, but everything remained pretty cordial. 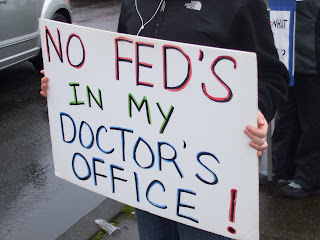 Opposition to government mandated and run health care was a major theme. 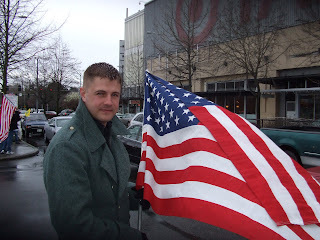 This young man is an Iraq war veteran, who is worried about the course his country is on. People were very friendly and very polite. 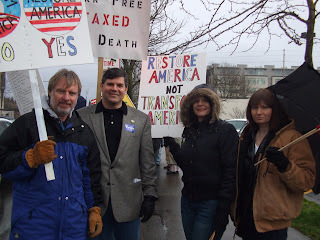 The man 2nd from the left is James Watkins, who is running for Congress in the 1st District of Washington State. Here's the sign I brought. Get it? A shot of a small part of the crowd. Andy and I just posted Episode IX of our Rain City Bunker Podcast. We're actually kinda interesting, if I do say so myself! In this episode, we follow up on a previous discussion about the Large Hadron collider, talk about the "lung flute", a vaccination for cocaine addiction, lab-grown meat, an interesting development in using CO2 in place of petroleum, and alternative energy in general. Listen and let us know what you think!